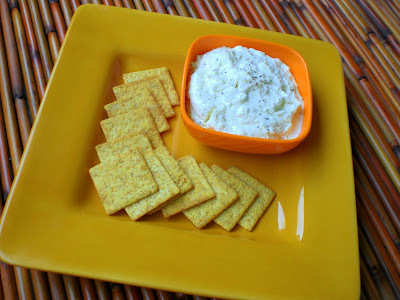 Here is a greek style herbed cheese spread/dip that is tangy and garlicky. I should have prefixed 'Instant' to the name as it takes no time to prepare this wonderful cheesy dip that can be served with crackers, raw vegetables like baby carrots or celery or even as a bread spread. 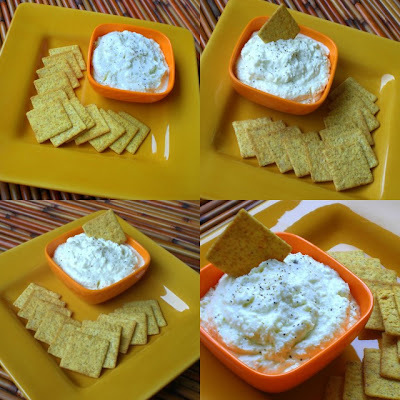 I have used Feta cheese which is widely used in greek cuisine, that gives a tangy and striking flavor to the spread. Here is the recipe. Combine all the ingredients in a food processor. Grind to a paste. Use this as a dip or spread on crackers or bread. The herbs used in this recipe can be adjusted according to your taste. A very good appetizer that you will surely enjoy. Variation: Add or garnish finely chopped green onions and/or finely diced tomatoes to the spread. This makes the spread more colorful. Asha's recipe for Greek Spanakopita : To the herbed feta cheese spread, add some cooked, cooled Spinach, wrap and bake in Filo dough/sheet. Here is the Spanakopita recipe that I found on the net. Thank you Asha for the idea. This is my entry to A Worldly Epicurean's Delight (A.W.E.D): Middle Eastern Cuisine an event initiated by Dhivya of Culinary bazaar now hosted by Siri of Siri's corner. Thank you Siri for hosting this event. 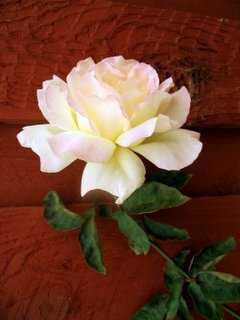 Thank you Asha. I included your tip in the post. Lovely looking dip Mythreyee! Thanks for sending this to AWED!! delicious dip, Mythreyee! lovely entry. I made your nimbu rasam twice and it is a hit always. thank you! I love Feta cheese. Love the salty taste . Excellent flavor, drizzle some olive oil on top and you have the Feta dip from Whole Foods ($7 a tub). Love it served on a pita crisp. Thank you for the recipe. Dried hot pepper flakes really liven this up.